Over the years, we have asked guests and Parisian friends for their favorite ideas of activities to share with children in Paris. 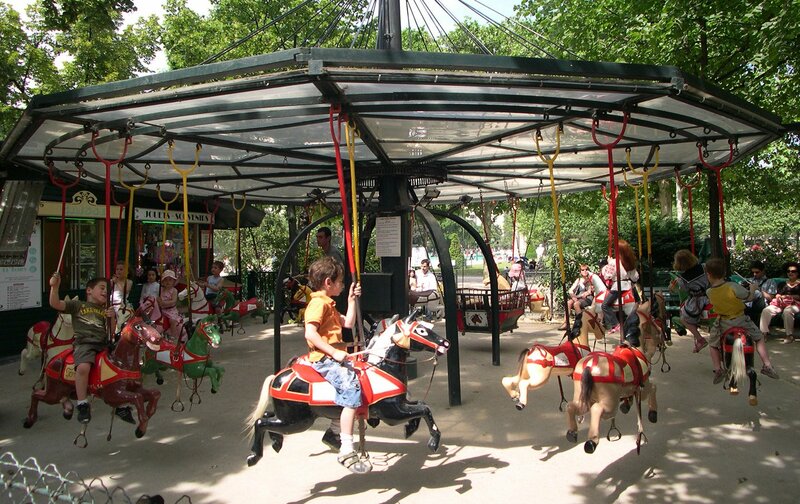 The votes are in and here are our Top Ten Things To Do in Paris With Children! Paris Pastry Hunt: Discover Your Favorite Pastries in Paris! This universal favorite for children, and often with their parents, too! Let your children choose the pastries for breakfast every morning, and it may just be one of the most memorable activities they’ll remember! There is a real advantage to staying in one of our Paris Apartment Rentals, because you can enjoy the local food and pastry shops … and save money by dining at home.Choosing pastries in Paris is enough to keep everyone busy for weeks. First there’s the question of whether to buy a simple baguette in the morning for breakfast, in addition to the true pate feuilleté pastries. Then there’s the perennial question of which local bakery sells the best baguettes.On to the finer choices and the list is delightfully long, fun and tasty! For children it is a chance to discover French food traditions along the way. One example is the difference between true croissants au beurre (butter croissants) and croissants ordinaire made with margarine. When our daughter was 8, we sent her to the Pâtisserie next door to buy croissants. Philippe had forgotten to teach her this important distinction and she accidentally bought croissants ordinaire thinking it meant without filling or garnish. Philippe took one bite and immediately discovered her mistake-quelle horreur-Alexia had bought croissants made with margarine rather than butter! It was a crisis until Philippe went back to buy true ones. Whew, breakfast saved.Beyond croissants, they’ll delight in choosing pain aux raisins, pains au chocolats, chaussons aux pommes (apple-filled tarts), pain brioche or the little sweet brioche rolls … fruit tartes and so much more! Parisian fun in the Champ de Mars! Seeing the wonderful views of Paris from the Eiffel Tower is an exhilarating experience for children. Spend time pointing out the sights in Paris you’ve visited or plan to visit. 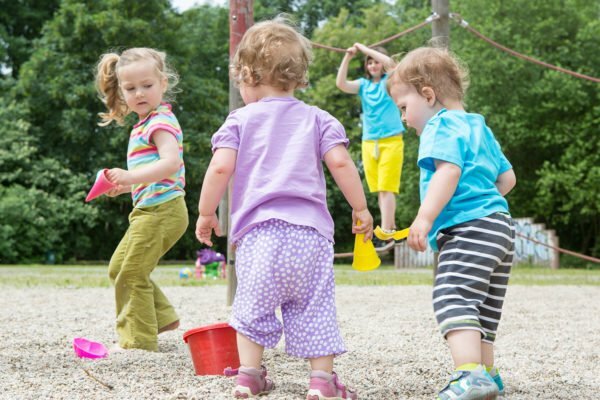 If your children have extra energy to burn, let them climb the stairs up or down. It’s 328 steps to the first level and 340 up to the second level. You’ll avoid lines and get some great exercise along the way! The Eiffel Tower has created a children’s game called “Follow Gus” that presents the tower’s history in a fun and engaging series of clues and stories. The game book is available at the Cineiffel audiovisual theater on the first level.Tip for families: Arrive at the Eiffel Tower just before nightfall so you’re there when the first magic light show begins every hour on the hour for five minutes. You’ll hear the crowds “Ohhhhhh!” and clap when it begins!Parks are a rarity in Paris and staying near one is a rare treat. Families have been taking their children to the Champ de Mars Park for generations. 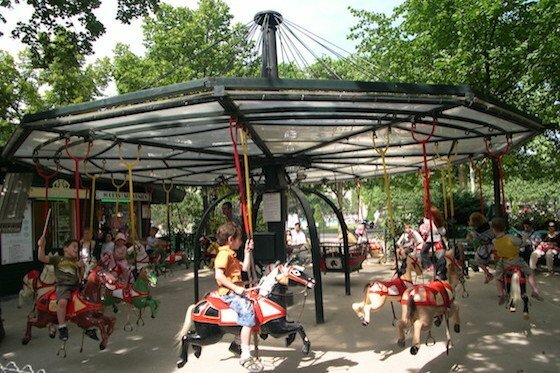 Grandparents and parents rode the same hand-cranked carousel, tried to catch the ring with their little batons, raced the pedal cars around the small track and went to the same Guignol, or ancient puppet theatre, when they were small. 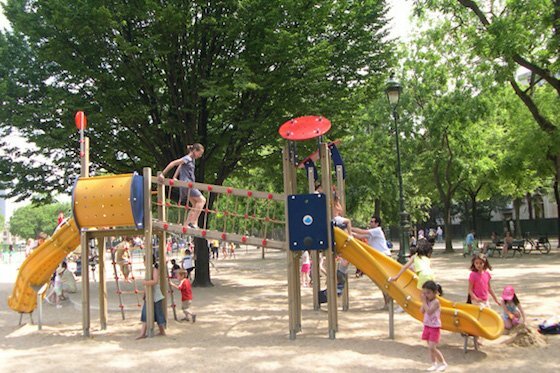 Relax on a bench along with Parisian families while your children run, climb, swing, bicycle, pedal and have fun! 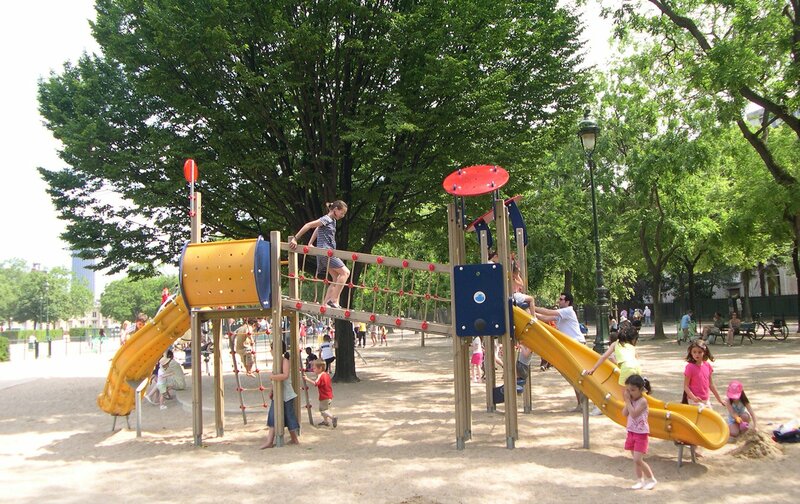 With the beautiful Eiffel Tower in the background, you’ll find four playgrounds, bicycling areas, a basketball court and lots of green space for picnicking in the Champs de Mars Park. We always tried to dream up activities that would wear our children out, especially our very active son. Climb the 387 steps to the top of Notre-Dame, where you can get close up views of the famous gargoyles and look over Paris. If your children enjoyed The Hunchback of Notre Dame by Victor Hugo, or Disney’s 1996 movie version, they’ll love exploring the Cathedral in a whole new light. It’s an entertaining and cultural experience rolled up in one! Kids love seeing the city sights on one of the classic bateau-mouche. It’s an easy and relaxing activity for the whole family. 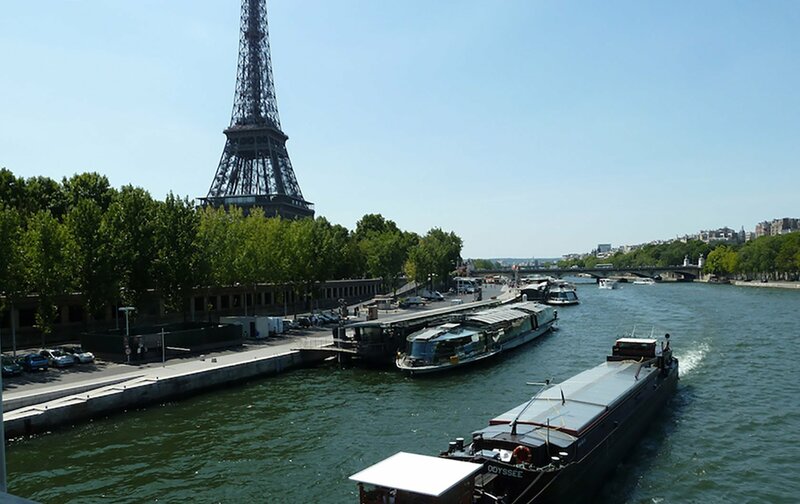 Boat tour starting points are walking distance from many of our Paris apartment rentals, and we sell discounted tickets for guests. Website: www.franceminiature.comThere are two more fun things to do with children that we couldn’t leave out of our Top 10 list. Consider them bonuses! Our favorite Paris concierge service says that the most requested tour for families is their Treasure Tour of the Louvres. 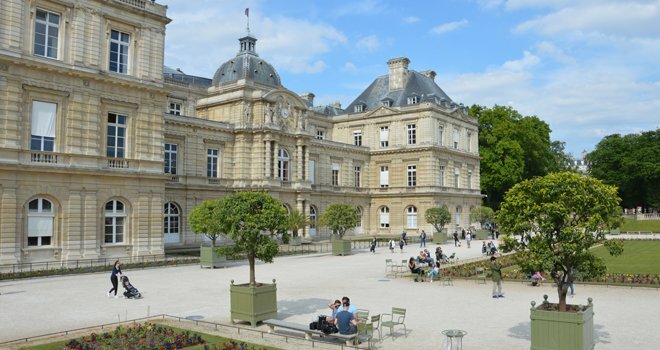 We love the idea of visiting the Louvre as a treasure hunt, helping children discover the art and history of this museum. For more information email [email protected]. Take a Paris bike or Segway Tour! Either enjoy Fat Tire Bike Tours located near the Eiffel Tower and many of our Paris apartment rentals. Alternatively, rent a Velib Bike Rental which are dotted throughout your Paris neighborhood. They are a little complicated to operate the check out and your credit card must have a pin chip, but the good news is that you can pick up and drop off at many convenient locations. PREVIOUS: The Merlot Apartment in Paris: Before, After & After Again! Posted on Wednesday, November 3rd, 2010 at 12:00 pm in See & Do. You can follow any responses to this entry through the RSS 2.0 feed. You can leave a response, or trackback from your own site. Helpful blog since I’m planning a trip with my ten yr old granddaughter. Numerous thanks I ought say, impressed along with your website. I will post this to my facebook wall. There’s also Marie Antoinette’s quaint little village and farm just behind Chateau Versaille. It’s called the ‘L’Hameau de la Reine’ and has goats, duck and geese roaming freely around the buildings and kids can pat the pigs in the sty. 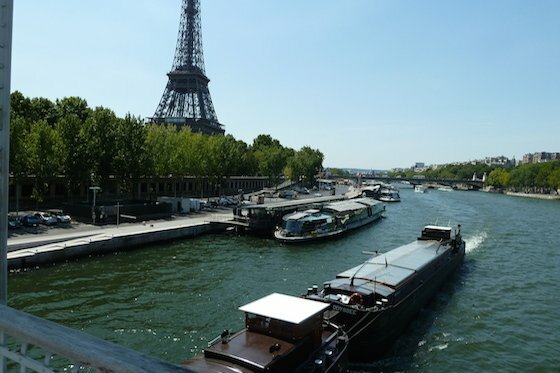 I’m also a fan of a boat ride on the canal leaving from Bassin d’Arsenal near Bastille. Its great to go through all the locks. And don’t forget to book a Family Photography Session with me right in front of the Eiffel Tower. Why not capture some memories for the future of your kids trip to Paris.